Museums generally adhere to a simple ethical standard: don’t sell the art to fix the roof. Instead of art, it could be classic cars, giraffes, daguerreotypes, or pot shards—but the principle is the same: if you sell the art to fix the roof, there is no need for a roof because there is no art to protect, no reason for people to visit, and no incentive for donors to give the museum anything else. Ever. Bill Bynum & Co. at the DIA’s Rivera Court, 2011. Detroit’s creditors have indicated that they think the art is non-essential to city functions. (Interestingly, no one has mentioned the giraffes owned by the Detroit Zoo.) 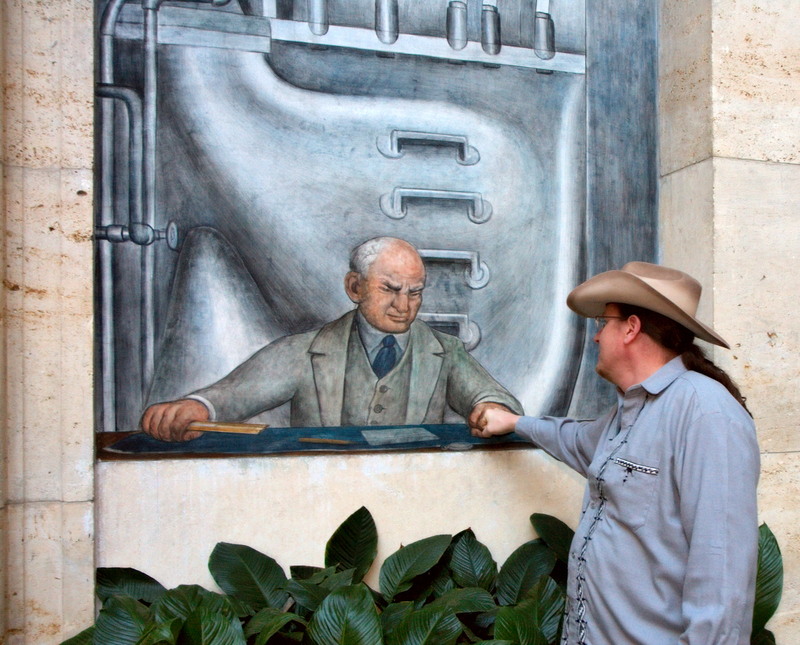 But at least one work defies that view—Diego Rivera’s “Detroit Industry” frescoes in the DIA’S great court. 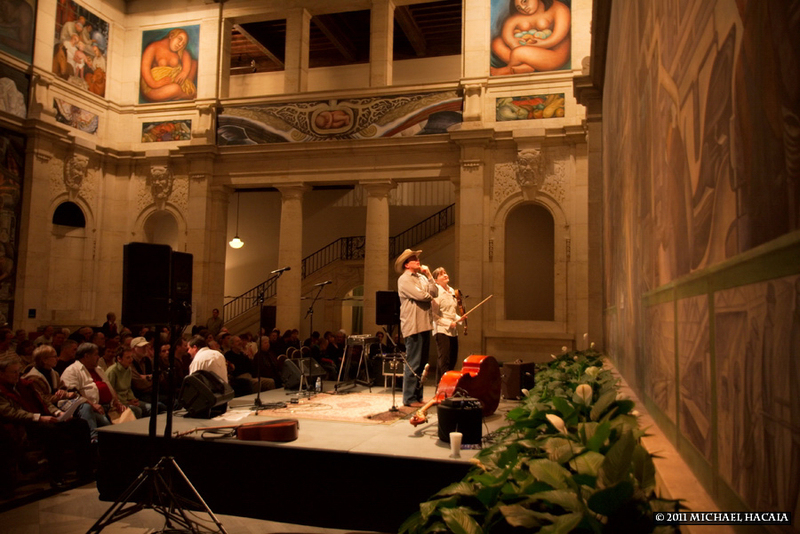 The Rivera court is the scene of popular weekly music events, part of the DIA’s “Friday Night Live!” which includes art workshops, gallery drawing, and guided tours. My band played there to a packed house in 2011, and it was the most memorable show I’ve played in 35 years of gigs. These huge and wonderfully detailed murals are conceptually and physically part of Detroit: inspired by the huge Ford Rouge industrial complex, commissioned by Edsel Ford, and painted on wet plaster so they’re literally part of the DIA’s walls. Any collector who bought it would have to move into the building to enjoy it (yes, technically they could be separated from the structure but you’d have to re-create the entire room to complete the work as it was). Forcing a rich collector to go to Detroit would be a fitting turn of fate—but why would anyone want to gaze daily on this heroic depiction of Detroit’s auto industry if he didn’t love and appreciate Detroit? And if the buyer loved Detroit so much, why would she want to bleed one of its cultural arteries? Many works of art at the DIA—including “Detroit Industry”—were given to the people of Detroit as a source of inspiration, solace, hope, and pride—not as a monetary asset to hide away in a vault to be raided on a rainy day. 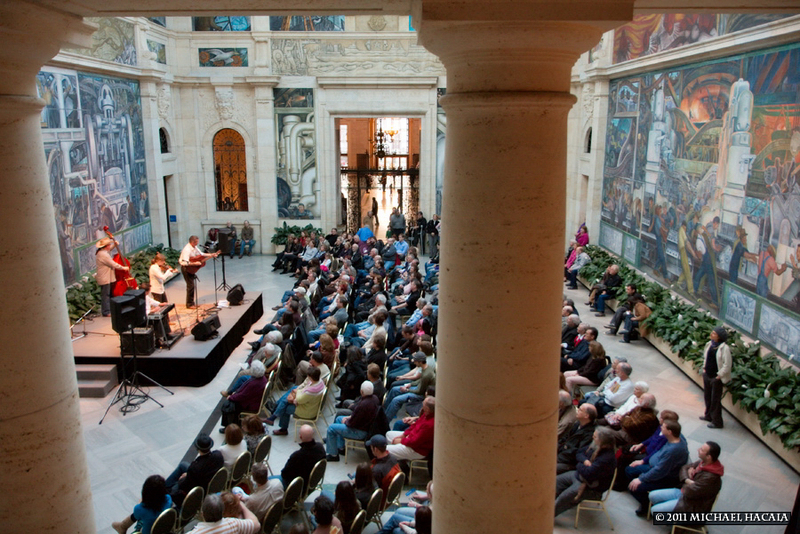 There are several efforts underway to find a way out of this fix and leave the DIA intact. I hope one of them will succeed. I doubt that that anyone making decisions for Detroit at this dark moment is listening—but just in case: please don’t sell the people’s art to fix Detroit’s roof. A city with no cultural assets is a poor city indeed. At least they can’t sell the music. ← What would Steve Jobs do?